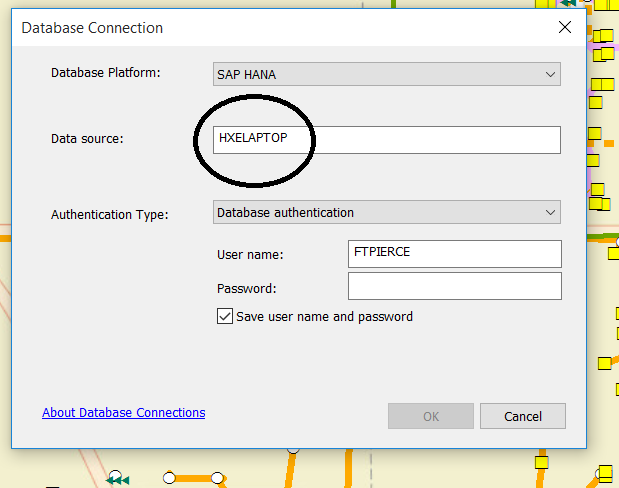 There’s plenty of articles and instructions on how to setup a HANA ODBC connection for ArcGIS Pro and Desktop. Check out these links to the Esri website including this link for ArcGIS Pro and this link for ArcGIS Desktop. Many of these pages don’t have screenshots and some leave out important details. Hopefully, this blog post fills those gaps. I’ll write another blog post on configuring ODBC for ArcGIS Server/Enterprise. 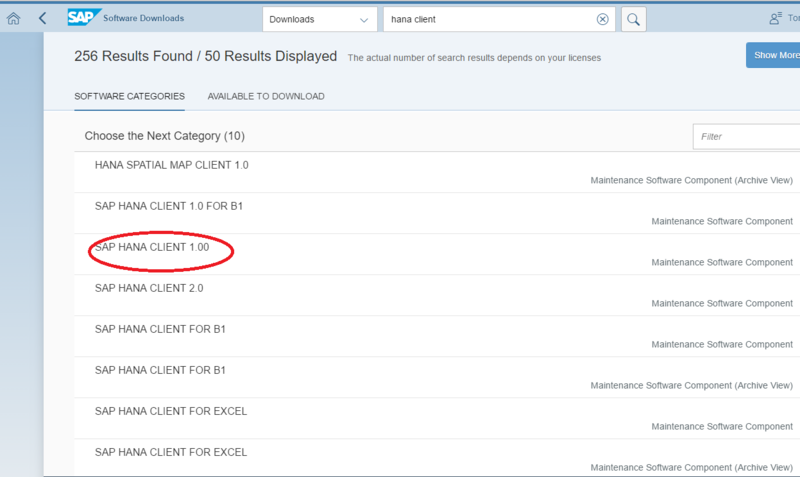 For starters, the HANA client you install depends on which ArcGIS product you’re connecting to SAP HANA. In these screenshots, I’m running HANA Express. Since HANA Express is a multitenant system, instance 00 in this case, the port used in the ODBC Manager is 30013. 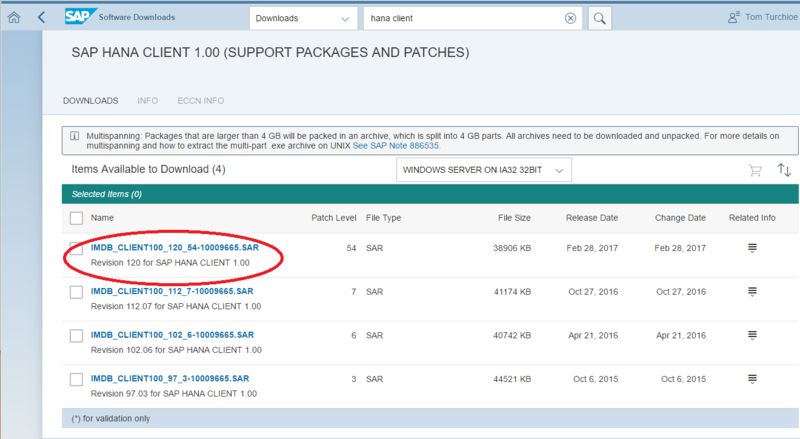 More information about the HANA ports can be found here. 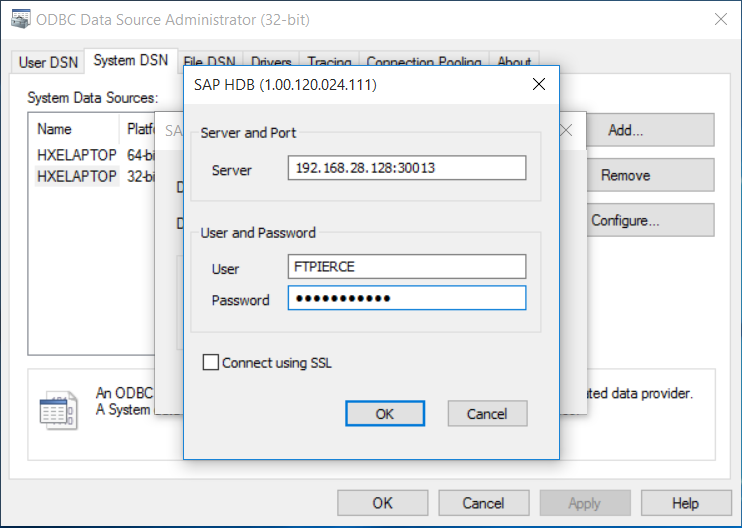 If you want to connect ArcGIS Desktop to HANA, you will need to install the 32 bit HANA Client ODBC driver. For ArcGIS Server and ArcGIS Pro, you will need to install the 64 bit HANA Client ODBC driver. You will need SAPCAR.exe to unpack downloaded .SAR file containing the HANA Client. 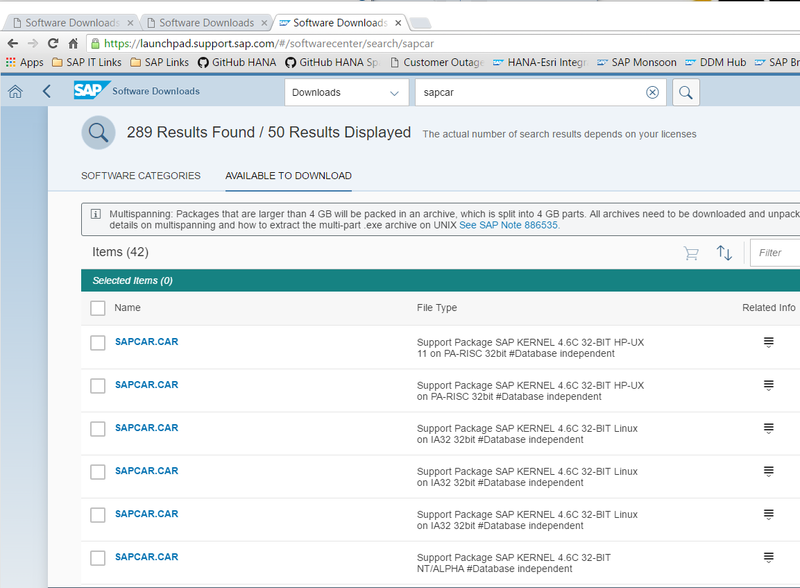 You can download the HANA clients and SAPCAR from here. ArcGIS Desktop 10.5. You should be running ArcGIS Desktop 10.3 or higher. Once the item is downloaded, unpack the archive using SAPCAR.exe. 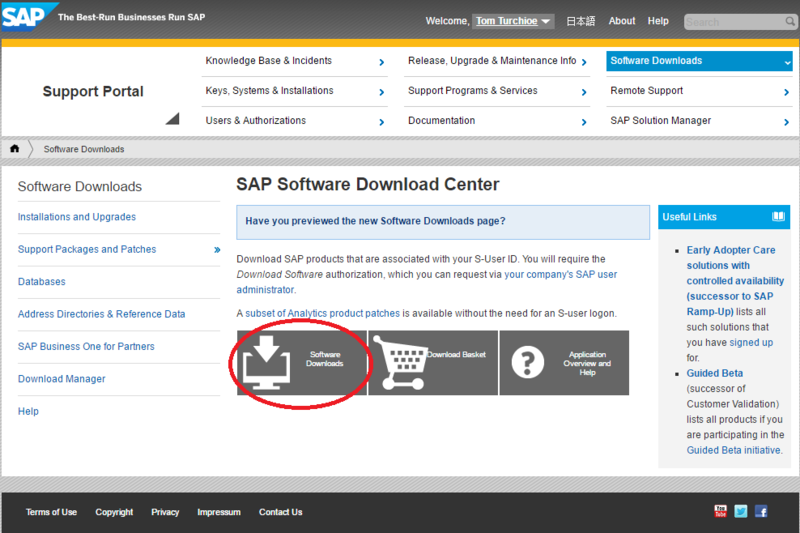 You can download SAPCAR from the software download center as shown below. For instructions on how to use SAPCAR, read more here. Once the item is unpacked, run the setup and follow the instructions shown here. The next step is to setup the ODBC driver. 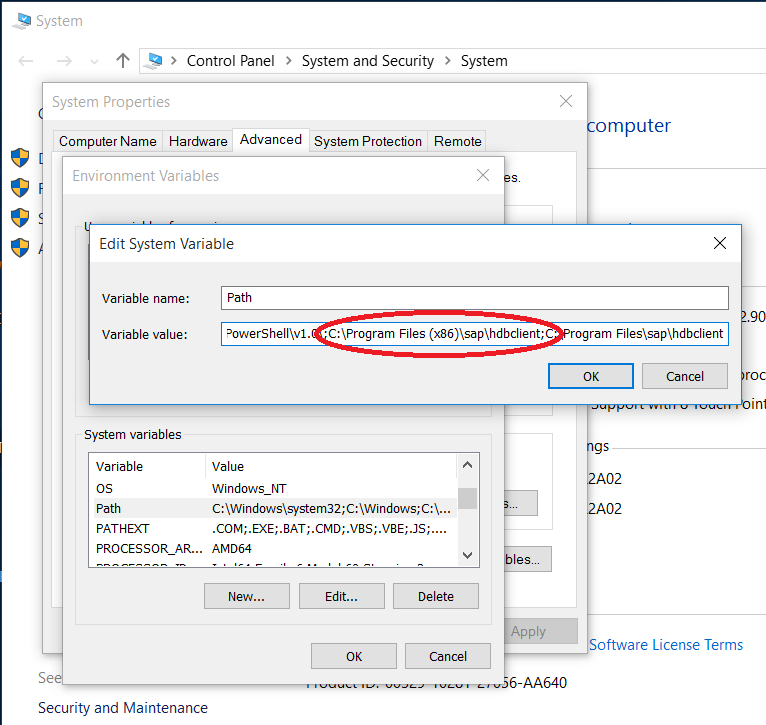 First, you must include the HANA client directory in the PATH environment variable in Windows. Assuming you have installed the HANA client on the C:\ drive, you would modify the path variable as shown below. The text in the red oval is the path to the 32 bit HANA client, the next entry is the path to the 64 bit HANA client. 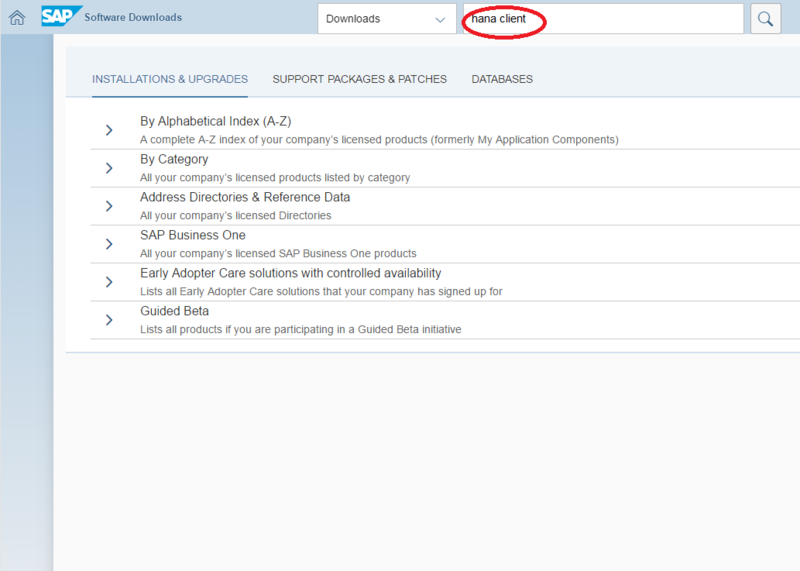 If you don’t include the HANA client directory in the path, connecting to the source in a later step will fail. You should always attempt to connect to the data source to avoid these problems. 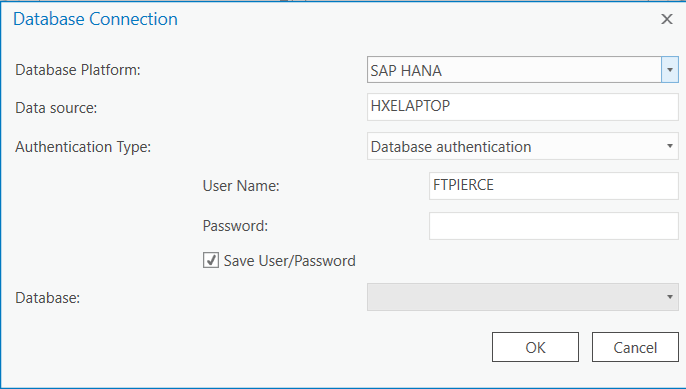 Remember that if you are connecting ArcGIS Pro to HANA, you will need to install the 64 bit HANA client and include that directory in the path as well. In previous releases of the HANA client, it was sometimes necessary to copy 3 files into the ArcGIS Desktop directory from the HANA client directory. However, modifying the PATH environment variable should be sufficient. Here is a screenshot for reference. Next, start the 32 bit ODBC Manager. This dialog should appear after clicking on the System DSN tab. It is here where you will create the HANA ODBC connection. To create a new connection, click on Add. In this case, I clicked on the Configure… button. Remember the Data Source Name because you’ll need it when creating a database connection in ArcCatalog. 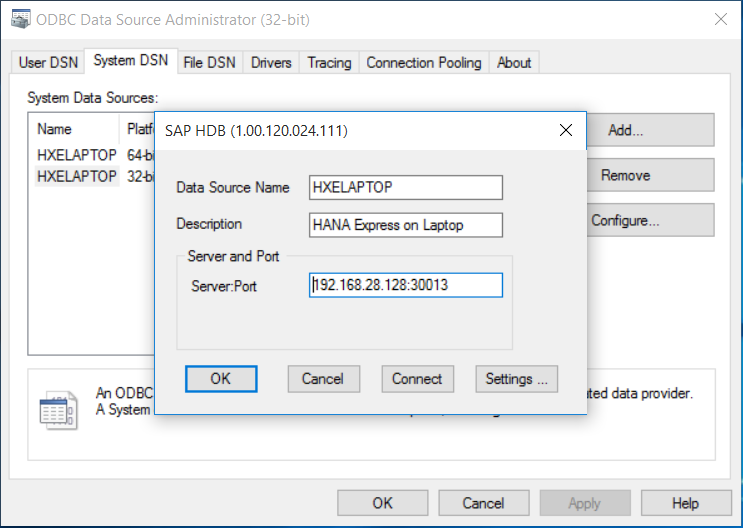 Enter the server and port information of the HANA instance you wish to connect to (see the link on ports I mentioned earlier). In order for the ArcGIS platform to utilize the HANA spatial capabilities, you must create a Special property setting (SPATIALTYPES = 1) by clicking the Add button. If your ArcGIS deployment is running ArcGIS Enterprise 10.6.1 or greater, you can skip this step. This is also true if you’re configuring ODBC for ArcGIS Pro 2.2 or greater. 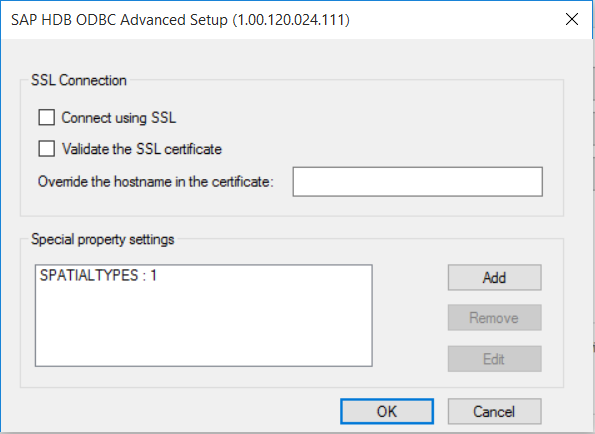 Now that you’ve entered the data source information and configured the special property, you should test the ODBC connection to make sure everything was entered properly. If all is configured properly, click OK and you should see a Success dialog. 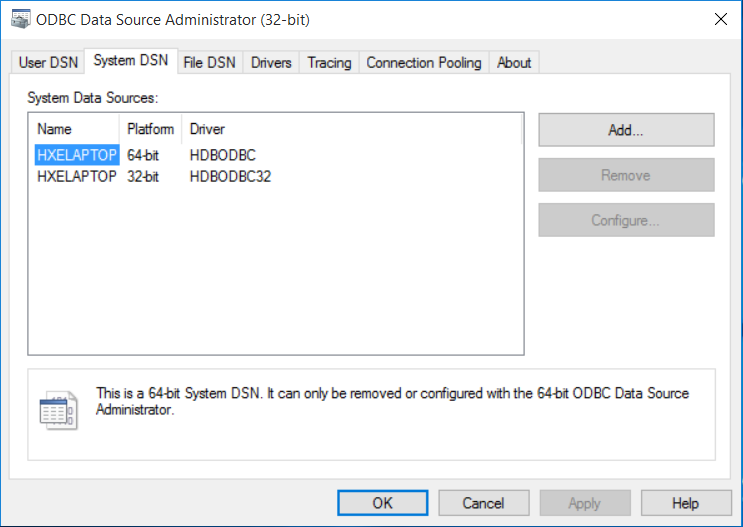 Repeat these steps using the 64 bit ODBC Manager if you want to configure a 64 bit ODBC connection for ArcGIS Pro. At this point, you’re ready to setup a database connection in ArcGIS Desktop using ArcCatalog. 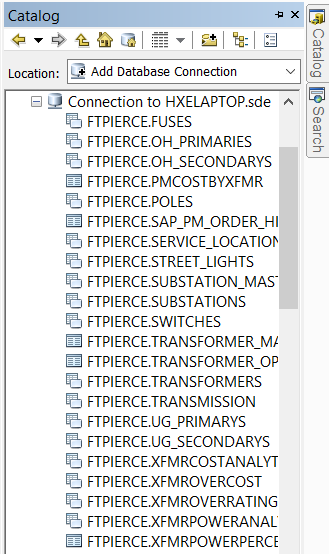 In this case, I started ArcMap, clicked on the Catalog tab on the right edge of the ArcMap window and double clicked on Add Database Connection. Enter the same data source name you used when creating the ODBC connection. In my next blog post, I’ll look at configuring ArcGIS Server (ArcGIS Enterprise for 10.5 and later). You’ll need to do this if you plan on publishing from ArcMap or ArcGIS Pro to ArcGIS Enterprise (or Server). The key thing to remember is the data source name you created above must match the data source name configured on any ArcGIS Enterprise instance you will publish to. what about Windows user logon ? 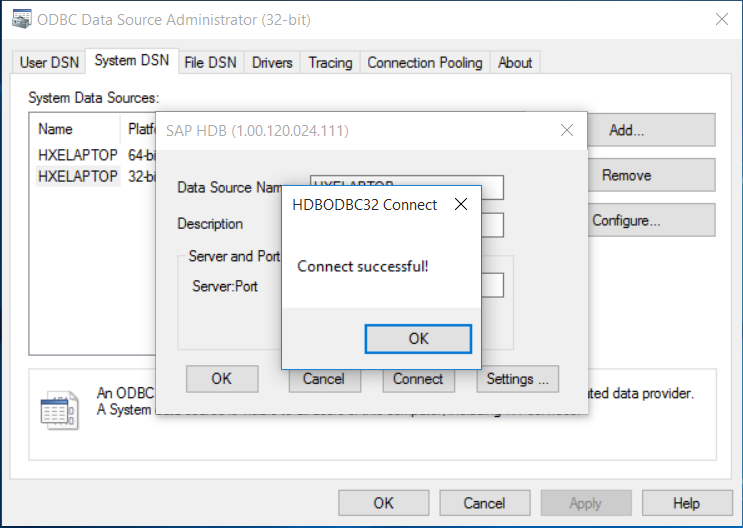 HANA ODBC driver allows this and that would be working. But our ARcGIS colleague claims this wont workfor the end user, when coming from Geocortex or ArcGIS authentication with our windows domain (via SAML). Question: How can the end-users ID be passed through from Geocortex to ArcGIS and then especailly to HANA ? We do not want to have a generic user but the real end-user reading from HANA DB. Or do ESRI and SAP still have a gap there?